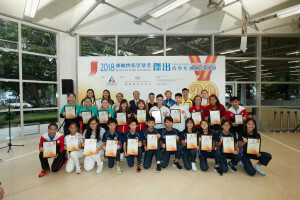 Organised by the Hong Kong Sports Institute (HKSI), supported by the Sports Federation & Olympic Committee of Hong Kong, China (SF&OC) and the Hong Kong Sports Press Association (HKSPA), the Sports for Hope Foundation (SFHF) Outstanding Junior Athlete Awards presentation ceremony for 2nd quarter of 2018 was held at the HKSI today. A total of 22 junior athletes were presented the Award for their excellent performance. 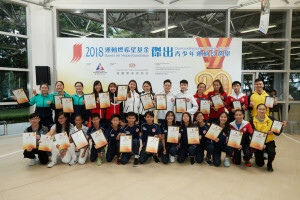 The awardees were Hsieh Sin-yan and Christelle Joy Ko (Fencing), Li Chi-kong and Tang Yu-hin (Karatedo), Chan Wing-yin, Chen Sze-ki, Lam Wing-ka, Ng Hau-pak, Ng Yuen-ying, Sin Ching-hei, Yam Tsz-hong, Yam Tsz-kin and Yuen Po-yi (Korfball), Cheng Cheuk-kwan and Leung Wing-wun (Rowing), Chan Sin-yuk (Squash), Chau Wing-sze, Lee Ka-yee and Wong Chin-yau (Table Tennis), Sheena Jade Masuda Karrasch, Wong Hoi-ki and Wong Hong-yi (Tennis). Hsieh Sin-yan won her second OJAA title this year after claiming champion in the Women’s Epee (Cadet) event at the World Junior and Cadets Fencing Championships 2018. She also won bronze in the Women’s Epee Individual at 2018 Asian Fencing Championships and finished in top eight in the Women’s Epee Individual at the Asian Games last week. 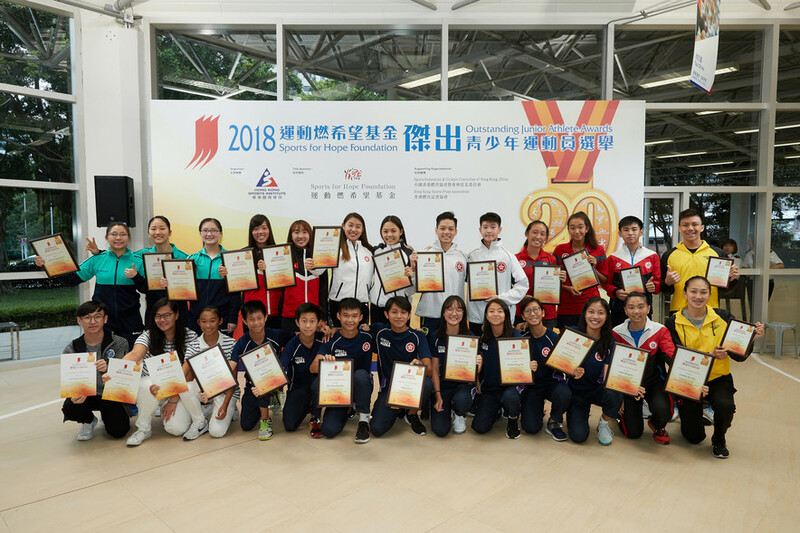 “The Sports for Hope Foundation Outstanding Junior Athlete Awards helps increase my confidence and get myself prepared to challenge further,” said Hsieh. Another fencer Christelle Joy Ko won her debut OJAA title by achieving the quarter-finals in the Women’s Foil (Cadet) event at the World Junior and Cadets Fencing Championships 2018. In round of 16, Ko fought three intense bouts against her opponent and managed to land her attack two seconds before time ran out. She eventually finished in 6th place and was qualified for the Youth Olympics. “The Awards helps motivate young athletes to improve and encourages them to work harder,” said Ko. Squash athlete Chan Sin-yuk won her fourth OJAA title by winning a silver medal in the GU17 event at the PBA 16th Penang (Malaysian) Junior Squash Open 2018. “I would like to thank the Sports for Hope Foundation for supporting junior athletes. This award is a validation of my effort, and I will continue to train hard and attain better results,” said Chan. In addition, Law Pak-ki (Squash), Chang Yujuan and Cheuk Ming-ho (Swimming) were awarded the Certificate of Merit for this quarter. 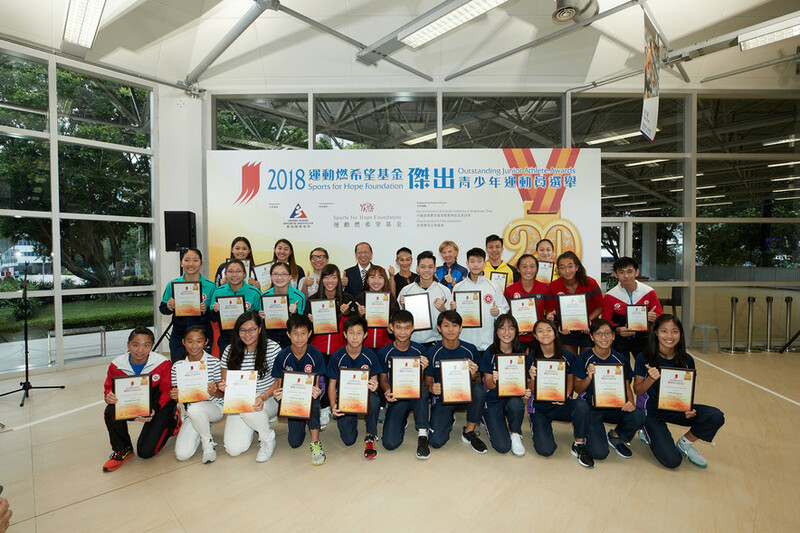 Jerry Lee, Sin Kam-ho (Dancesport),Yu Chuen-yiu, Yu Ka-po (Karting), and Chan Cheuk-ying, Law Ying-tung (Finswimming) were presented with the Certificate of Appreciation to recognise their hard work.